Couples ready to tie the knot in Cincinnati have ample venue choices, from a historic boutique hotel and a modern art museum to a country chapel or a beautiful park. Cincinnati, Ohio even has seven garden wedding venues in four city parks - now that's a dedication to love. 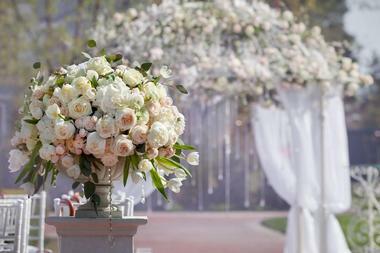 Whether you are dreaming of a spring, fall, summer or winter wedding, Cincinnati, OH is a great place to get married. 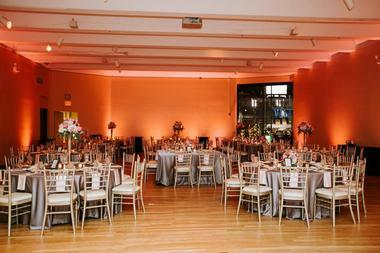 The Contemporary Arts Center caters to the modern couple looking for an edgy, artsy backdrop for their big day. Located downtown in the Rosenthal Center for Contemporary Art at the corner of 6th and Walnut, this stylish venue is in the busy heart of the city. The three primary wedding reception areas are Kaplan Hall, which accommodates 210 seated dinner guests, Black Box Theatre and Lobby Lounge seating 150 guests, and the Exhibition Galleries, which accommodate 250 seated dinner guests. 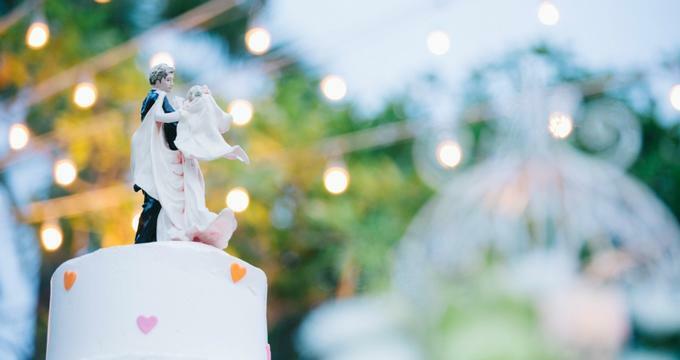 Wedding amenities include in-house officiant and wedding coordinator, preferred caterers list, private rooms for the bride and groom to prepare, a dance floor, and a children's entertainment area. For those who've ever dreamed of seeing their name in lights, this is the wedding venue to choose. 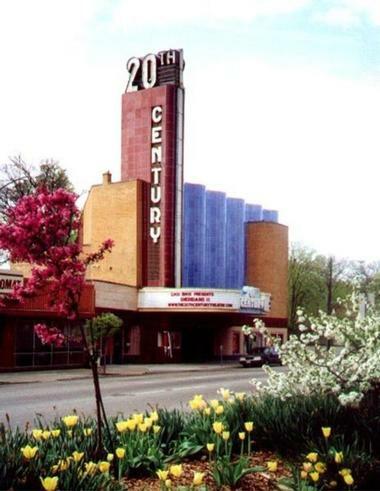 The historic 20th Century Theater, built in 1941 in the Neoclassical Modern architectural style, is ideal for vintage weddings. The theater offers couples a Friday night wedding special that includes a $500 discount on the venue; tables and chairs; china, glassware, and linens; main and VIP rooms, setup and cleanup, and yes, the happy couple's name in lights on the theater marquee. Wedding packages are all-inclusive, a relief for busy couples who don't have time to juggle outside vendors. The in-house DJ, photography, and videography are top-notch. 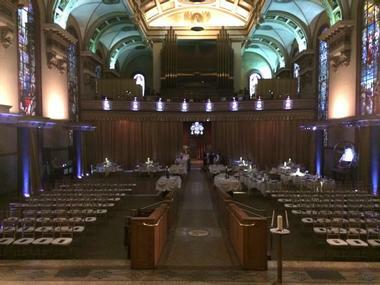 Bell Event Centre, once the 1850 St. Paul's Church, is a uniquely beautiful wedding venue with vaulted ceilings, hand-painted wall and ceiling murals, extraordinary stained glass windows, and original terrazzo flooring. This elegant venue is a good choice for traditional weddings, and wedding amenities include space for 300 seated reception guests (250 with ceremony included), a cobblestone courtyard, day of coordinator, bride and groom suites, cake cutting, luxury linens and tableware, service staff, and setup and cleanup. Couples can choose buffet or plated dinner options, hors d'oeuvres, and rehearsal dinner and send-off brunch menus at this historic venue with a museum-quality sophisticated ambiance. 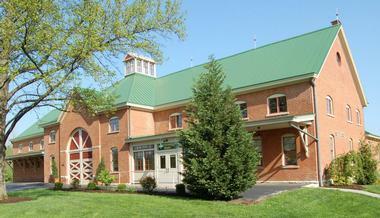 Centennial Barn is the go-to venue for country, rustic, casual, or outdoor wedding celebrations. The 1898 Barn has been renovated to include state-of-the-art sound and lighting technology, dance space, and a viewing loft. St. Clare Chapel is also on the 35-acre property, providing an easy transition from ceremony to reception for couples who choose to use it. The picturesque property with ample green spaces, a terrace, and gardens provides both privacy and tranquility. Setup and breakdown, tables and chairs, use of a large kitchen, and use of onsite audiovisual equipment are included in the affordable rental price, and rental proceeds benefit local charitable efforts. 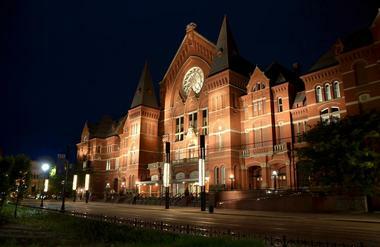 Cincinnati Music Hall is the crown jewel of Cincinnati's performing arts scene. The 1878 Gothic-style building was designated a National Historic Landmark in 1975 and is considered to be among the most stunning concert theaters worldwide. This venue is adjacent to Washington Park in the Over-the-Rhine neighborhood. 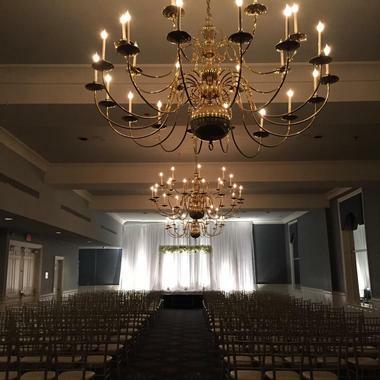 Newly renovated in 2017, its signature wedding event spaces are its dramatic foyer for cocktail receptions and the sophisticated ballroom for dinner and dance receptions. The foyer has gleaming tile floors, elaborate chandeliers, and distinctive white columns - great for a vintage themed wedding. The luxurious signature ballroom accommodates weddings of up to 300 guests. Cincinnati Parks has designated seven outdoor wedding venues in four parks. Lookout neighborhood's Ault Park provides the couple and 150 guests beautiful arbor settings in two annual and perennial gardens. Three venues in the Mt. Airy Forest Arboretum include Braam Memorial Garden Gazebo and azalea garden that accommodates 150 guests and Meyer Lake Gazebo adjacent to the lake with space for 100. Vasey Garden with a patio and arbor seats 50. 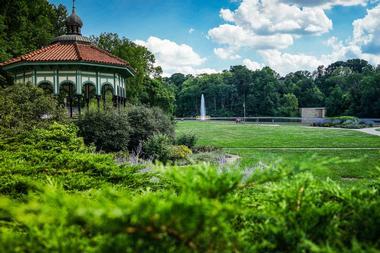 Eden Park's Hinkle Gazebo in Walnut Hills sits among flowerbeds and magnolia trees and can seat 50 guests. Lastly, Clifton's Mt. Storm Park offers the Temple of Love, a domed mid-nineteenth century pavilion and a grassy area that accommodates 200 guests. 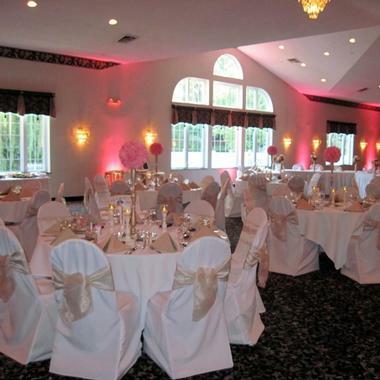 Cooper Creek Event Center is an upscale wedding venue overlooking the beautiful, award-winning Blue Ash Golf Course. This wedding venue can accommodate an indoor or outdoor ceremony and a ballroom seated dinner/dance reception for up to 350 guests. Venue amenities include a private bridal suite, stone fireplaces, and a full-service bar. The ceremony and reception package includes exclusive access to the event level, an onsite wedding coordinator, a day of event supervisor, a complimentary bridal party champagne toast, complimentary cake cutting and plating, a one-hour ceremony rehearsal, and four rounds of golf with a cart. Couples who are also golfers and want an elegant wedding will appreciate this venue. 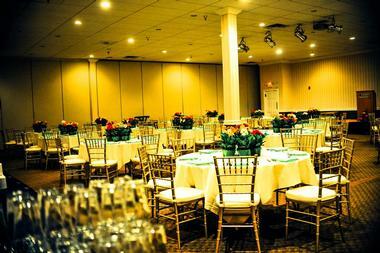 The Elements at Ramada Plaza is a versatile wedding venue that can accommodate nearly any wedding theme. The Grand Ballroom holds 550 wedding guests for a sit down dinner reception, or it can be divided into three smaller spaces. Affordable wedding packages include an onsite event specialist, linens, china, flatware, and glassware, table centerpieces, professional service staff, cake cutting and plating, and a four-hour room rental. Couples can upgrade their wedding package to silver, gold, and platinum amenities. An additional amenity is the Elements Limousine Service. Couples can send it to fetch out-of-town guests from the airport, provide transport for bachelor and bachelorette parties, or save it for themselves on the big day. The award-winning Hilton Cincinnati Netherland Plaza Hotel, a premier wedding venue, is located in the heart of Downtown Cincinnati. This National Historic Landmark hotel is one of the city's best examples of French Art Deco design and provides more than 40,000-square-feet of dynamic event space. 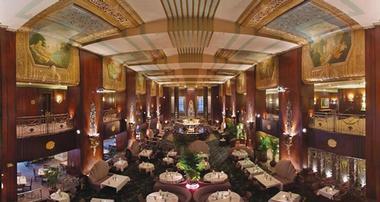 The hotel features three outstanding ballrooms, the Hall of Mirrors, the Pavillion, and the Continental. The Hall of Mirrors is by far the most sought after venue. With a design reminiscent of the Palace of Versailles, it offers an exotic ambiance with unique effects. Dramatic 30-foot-high ceilings, German gold and silver light fixtures, gold-plated mirrors, and an exquisite balcony are just a few of the design features. 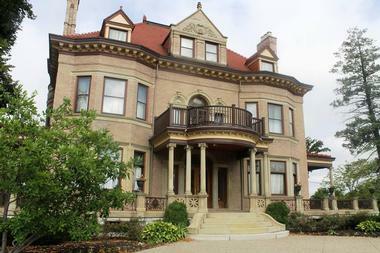 The Historic Hauck Mansion was built in 1904 as a summer estate for Cincinnati Beer Baron, Louis Hauck. Built by local artisans, this magnificent mansion features 22 beautiful rooms, nine fireplaces, gorgeous stained glass, and mosaic tiles. The mansion underwent a meticulous restoration in 2008, returning the establishment to its former glory and making it an excellent venue for vintage style weddings. 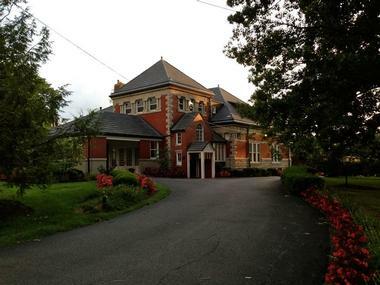 The mansion can accommodate up to 100 guests indoors and up to 200 guests outdoors with each carefully appointed event space offering a unique design element. The mansion's highlight is a grand staircase that descends into the opulent foyer featuring lead glass doors that provide a romantic backdrop for the ceremony. 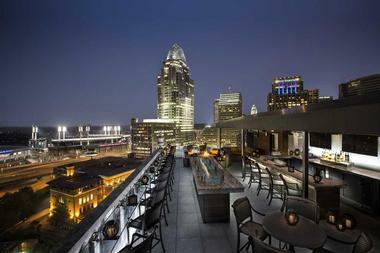 Millennium Cincinnati is a contemporary hotel in the heart of Cincinnati's Financial District offering couples more than 26,000 square feet of event space. They feature three unique reception venues, the Grand Ballroom, the Bronze Ballroom, and Ventanas. Each of these spaces features soaring ceilings, rich furnishings, and awe-inspiring views of the city. The Grand and Bronze Ballrooms are ideal for opulent and lavish weddings comfortably accommodating between 300 and 600 guests. Located on the 31st and 32nd floors of the hotel, Ventanas is a contemporary space featuring floor-to-ceiling glass windows, and it can accommodate up to 145 guests. Pinecroft Mansion is the historic home of Powel Crosley, Jr. The Tudor home has original teakwood flooring and mahogany paneling that provides a warm and elegant ambiance. Nestled in the cozy neighborhood of Mt. Airy, this mansion is surrounded by 17 acres of land that is home to stately maple, evergreen, and oak trees. The grounds include a charming lake and a Garden Pavilion. This outdoor oasis can accommodate up to 325 guests and features hardwood floors, soaring ceilings draped in white silk tapestry, lavish sparkling crystal chandeliers, and plush cream furniture. The property also includes plenty of indoor venues within the mansion, which is ideal for intimate and romantic weddings. 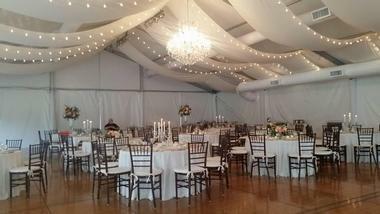 Premier Park Events is a unique events company that works exclusively with nine one-of-a-kind Cincinnati parks characterized by their own unique natural beauty. They include Ault Park Pavilion, Alms Park Pavilion, Mt. Echo Park Pavilion, TM Berry Friendship Park Pavilion, the French House, the Gibson House, Krohn Conservatory, Oak Ridge Lodge, and Maple Ridge Lodge. Couples will find a variety of style choices, from the European elegance of Ault Park, beautifully built of natural stone, to the visually stunning and architecturally significant Art Deco Era Krohn Conservatory. An old-red brick estate, a 19th century Revival Mansion, and an Italiante-styled pavilion are just a few of the other choices. Renaissance Cincinnati is a luxury hotel in the historic district of Cincinnati boasting a contemporary design with over 14,000 square feet of event space. Their most prominent venue is the Burnham Hall Ballroom designed in 1901 by renowned architect David Burnham. This luxurious venue features an opulent domed ceiling with gorgeously detailed texturing and tiling accents and provides magnificent panoramic views of the cityscape. 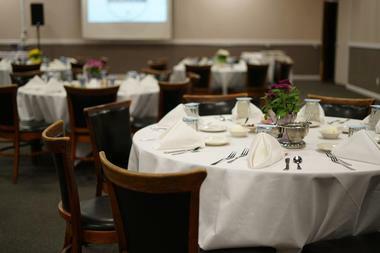 The hotel also has unique areas like the Private Dining Room, an ideal spot for a rehearsal dinner or small reception. This chic venue features elegant lighting and vibrant pop art to create a fun and relaxing atmosphere. 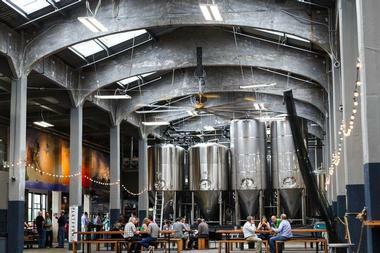 Rhinegeist Brewery is a one-of-a-kind venue that offers more than 25,000 square feet of space. Originally the home of the Morlein Brewing Company back in 1895, it has since been completely restored and renovated to showcase an industrial-chic design. Here, you will find two private event rooms; the first one is the Rhinegeist Event Space featuring 6,000 square feet with pine floors, brick walls and an open-wood rafter ceiling with skylights. Their second room is the Annex, boasting 2,000 square feet of space, distressed brick walls, soaring ceilings, bistro lighting, and a projection screen for multimedia presentations. Each of these rooms comes with access to the Public Brewery and Tap Room and seasonal Rooftop Bar. Just six miles outside of Cincinnati, the Farm is a modern banquet facility perfect for couples who want versatility in designing their wedding reception with the help of expert staff. It features two grand halls that can each accommodate 50 to 300 guests; for larger weddings they can remove the separating wall to create one large space. Both rooms are equipped with their own kitchens, bar areas, and dance floors. Their wedding package provides most of the materials necessary, including catering, linens, candle centerpieces, furnishings, and alcohol, and they also handle the setup and cleanup. The only things left to the bride are the cake, flowers, photography, and entertainment. The Glendale Lyceum, a private social club established in 1891, features an elegant red-brick clubhouse and perfectly manicured grounds with lush greenery and stately trees. 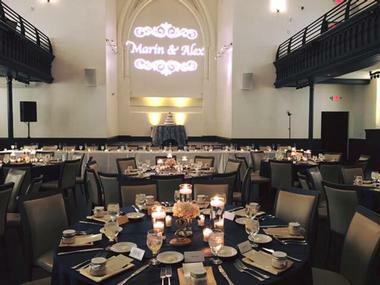 This historic venue offers both unique and luxurious indoor and outdoor event spaces that are ideal for vintage-style weddings with a contemporary twist. Their Main Hall, perfect for large opulent weddings of up to 275 guests, is decorated with hanging crystal chandeliers and elegant French doors. The Ballroom offers a classic design with modern architectural details, creating an intimate and romantic setting with an attached tearoom for extra space. Glendale Lyceum can also create a grand outdoor oasis with covered tents surrounded by their open green space. Located in downtown Cincinnati, the Phoenix is a premier wedding venue, and one of the finest examples of Italian Renaissance architecture in the city. Renowned architect Samuel Hannaford built the structure in 1893, utilizing original stained glass and marble imported from West Germany in the early 1880s. Its most prominent fixture is the winding white marble staircase, which adds to the charming elegance and regal splendor of the building. Wedding ceremonies and receptions can be hosted in one of three locations within the Phoenix. The first floor features the Tea Room, perfect for small, intimate gatherings. On the second floor and third floors are the Archway Ballroom and Grand Ballroom respectively, ideal for grand and lavish affairs. Nestled in the southwest area of Washington Park, the Transept is an iconic wedding venue ideal for couples who want a traditional wedding with vintage elegance. Originally built in 1867, this former German-American church has been transformed into a magnificent event space that still maintains its historic German Gothic architecture and design. Dark hardwood flooring, a mezzanine with gorgeous arched windows, antique chandeliers, ornate detailing, and a 50-foot vaulted stained glass ceiling give the reimagined church a romantic and luxurious ambiance. They feature six additional spaces aside from the main room, excellent for small receptions, cocktail hours, and rehearsal dinners. The Westin is a premier hotel featuring three distinct venues perfect for couples who want an elegant and traditional wedding with a modern twist. Their Presidential Ballroom is the largest and most ornate of their event spaces, boasting 15-foot-high ceilings and programmable ceiling light fixtures. Alongside the ballroom is the magnificent Gibson Foyer with a Light Wall on the west side that's ideal for creating photo montages, an excellent area for pre-ceremony cocktails. Their Fountain Room has an urban layout that flows from the atrium and overlooks historic Fountain Square and cityscape. Taft Ballroom provides a rustic ambiance with 11-foot-high ceilings and warm wood design accents. Top of the Park is the outdoor rooftop terrace of The Phelps Inn, an ideal locale for couples who want a unique wedding in a casual and relaxing atmosphere. Recently expanded, it offers the bride and groom a choice between the Upper or Lower terraces featuring tiled flooring, black furnishings with bold pops of color, a full bar, communal fire table, and fire pit. 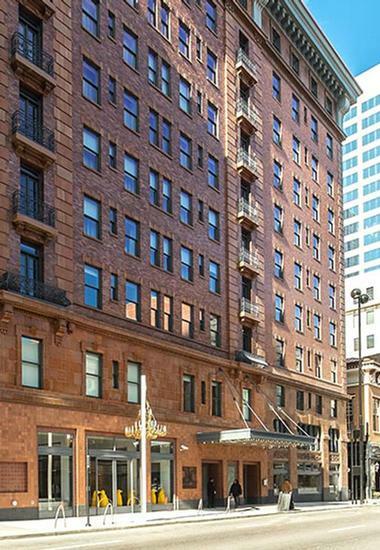 The most breathtaking aspect of this location is the unparalleled 360-degree views of downtown Cincinnati, Mount Adams, Lytle Park, and the Ohio River. Top of the Park provides expert event planners to handle all the details and can comfortably accommodate 90 guests on either terrace. 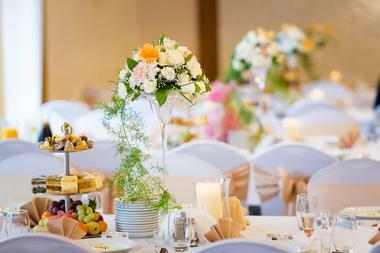 Wunderland is an exquisite family owned and operated banquet hall ideal for elegant, traditional weddings. This gorgeously decorated hall features a vaulted ceiling with sparkling crystal chandeliers, grand picture windows, and a large dance floor with a platform stage. The décor is luxurious yet simple with neutral tones and soft lighting, allowing each couple to design the hall to their chosen style or theme. Wunderland can accommodate anywhere from 75 to 400 guests comfortably. The banquet hall is also equipped with a charming softly lit deck and magnificent gazebo surrounded by lush greenery, towering mature trees, and two picturesque ponds creating a flowing indoor to outdoor reception space. 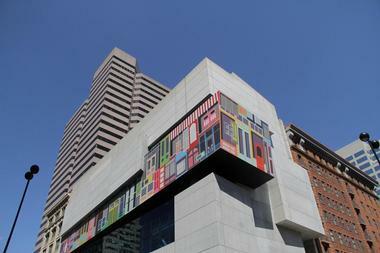 21c Museum Hotel Cincinnati earned the #1 Hotel in the Midwest Readers' Choice Award from Condé Nast Traveler, making this an in-demand wedding venue. This historic downtown boutique hotel is on the National Register of Historic Places and features a contemporary art museum and award-winning restaurant. Luxurious and contemporary with a Cocktail Terrace overlooking downtown Cincinnati, this venue is suited to a variety of wedding themes from classic to casual. The Main Gallery seats 120 wedding dinner guests or 200 cocktail reception guests. 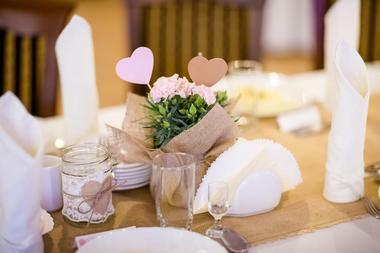 Other smaller galleries are available for more intimate weddings. Metropole, the hotel's signature restaurant, provides personalized catering. 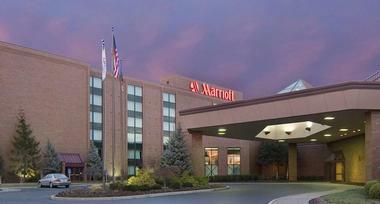 Couples looking for award-winning certified wedding planners versed in all types of weddings, including ethnic and military, will want to consider Cincinnati Marriott Northeast for their big day. These professional planners can help you crystallize your vision and execute it in style, while keeping your budget in mind. They'll advise on menu, décor, flowers, photographers, and entertainment. There are 11 venues onsite, including their signature luxury ballroom seating 525 guests and their smallest banquet room seating 30 guests. 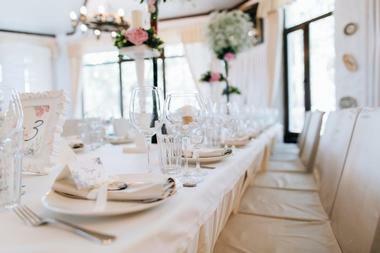 The hotel offers complimentary wedding ceremonies, including two dressing rooms, when booked with the reception. Rehearsal dinners and send-off brunches are also available.